Bullying is an issue of great concern for both parents and children in today's society. It is not, as some would say, "normal behavior" or "the right of passage". In American schools and communities bullying has reached epidemic proportions. Its devastating scars affecting the lives of children for years to come. The statistics are staggering. According to the National Crime Prevention Council, six out of ten teens in America witness an act of bullying behavior at least once a day. In grades 6-10, nearly one in six - or 3.2 million - are the victims of bullying each year. Many are still unclear as to what the term "bullying" actually is. Being "bullied" is when another student/child, or group of students/children, say or do vicious and unpleasant things to another. What most people don't realize is that verbally teasing someone repeatedly in a way that he/she does not like is also a form of bullying. In addition to the physical markings, which a victim can receive in a bullying confrontation, there are also numerous emotional scars associated with bullying. Some of these consequences include lowered self-esteem, absenteeism from school and/or social events (out of fear of an attack), physical problems such as loss of appetite, colds & coughs, depression (sometimes even leading to suicide) and dropping out of school and social circles. Bullying has even caused an increase in children carrying weapons. Harassment and bullying have been linked to approximately 75 percent of school-shooting incidents. Over the course of a year, nearly one-fourth of students in school have reported that they have been harassed or bullied on school property because of their race, ethnicity, gender, religion, sexual orientation or disability. There is no rhyme or reason as to why a child is singled out as the target of a bully, only the sad fact that it DOES happen. Your best line of defense is arming your child with knowledge and confidence pertaining to bullying. Be sure that they know what it is, how to recognize it, and what to do when it happens. Become familiar with your schools policy on bullying. Practice different scenarios with your child to reinforce their skills and how to get to safety. Make certain that your lines of communication are open. Your child's preparedness is the key when faced with this kind of situation. Bullying is currently a serious public health concern. The federal government is planning a $3.4 million dollar campaign to combat bullying beginning this year. The goal is to create a culture where bullying is no longer viewed as cool, parents are tuned in to the warning signs, kids stand up for each other and teachers are trained to intervene. One of the best tools currently available to parents, children, schools and organizations is Revelation Martial Arts’ "Best Defense" video series, The Bully Factor (Vol.#1). You will not need a background in, or any familiarity with, the martial arts to learn these techniques. The video presents several ways to defuse a bullying situation before it ever turns physical. If it has progressed to the physical stage, then children are taught (by an enactment followed by specific step-by-step instruction in slow motion) how to get themselves free and to a safe zone. 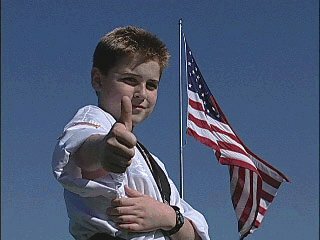 The Bully Factor is a non-aggressive instructional tape featuring Nationally Ranked Martial Artist & Black Belt Instructor, Patrick McKay. The video's greatest features are that it is NON-aggressive and taught "BY kids, FOR kids" - which makes it much more enjoyable for families to watch together. It even presents an interactive quiz to review what you have learned. Attack Proof: The Ultimate Guide to Personal Protection by John Perkins, Al Ridenhour, and Matt Kovsky. Real self-defense is not a game or sport. While martial arts may teach disciplined thoughts and movements, most come up short when it comes to self-defense and survival in brutal, real-world attacks. Patterned, choreographed techniques are often useless amid the chaos and random dynamics that characterize real threats. This book presents a proven personal protection system for anticipating and fending off even the most brutal assaults. It's based on the insights, real-world experiences, and forensic research of a New York cop who is a teacher of hand-to-hand combat instructors in the military and police forces and who survived over 100 violent armed and unarmed encounters. Attack Proof trains you to become a martial "realist" by abandoning all forms and techniques in favor of principles that teach "guided chaos". Attack Proof is the next best thing to having your own personal bodyguard.